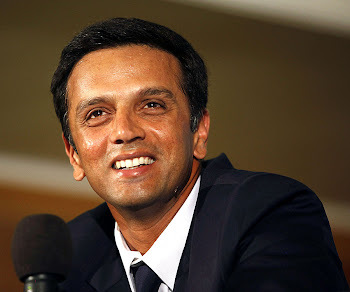 Rahul Dravid: RCB on the verge of "Do-or-Die"
RCB on the verge of "Do-or-Die"
Nothing went wrong- RCB batted well, fielded well, bowled well, but the result wasn't well. Excellent batting from Suman and Symonds handed RCB another defeat at their home ground. The pitch was excellent for T20 game- had some grass on it and bounce as well. Both teams planned their batting strategy really well - playing 7-8 overs patiently and then going after the bowlers. Kallis and Kohli were the batting stars for RCB scoring 68 and 58 resp. RCB managed to score 69 runs off last 4 overs to build a solid total of 184. In reply to this, DC started off too slow. At the end of 7th over, DC were 43/1. But the patience paid off. Next 3 overs went for 37 runs and the chargers were on the move. Kumble managed to remove Gilly and Vinay Kumar grabbed the wicket of Rohit Sharma. With the game equally poised, Symonds entered the ground. Both Suman and Symonds went after the bowlers and won the match for their team. RCB has to win at least 2 (preferably 3) out of the 4 games left to ensure their position in the final 4. They will be facing KKR, DC, RR and MI in the next 9 days.